All songs and lyrics by Sarah Buechi. Fernsehen. Mixed by Florian Pittet at Studio de la Fonderie, Fribourg, June 19, July 12, Dez 12, 2013. Mastered by Christoph Utzinger, Berne. Cover art: Conor O'Donnell. Photos: Remo Ubezio. Liner notes: Christian Rentsch. 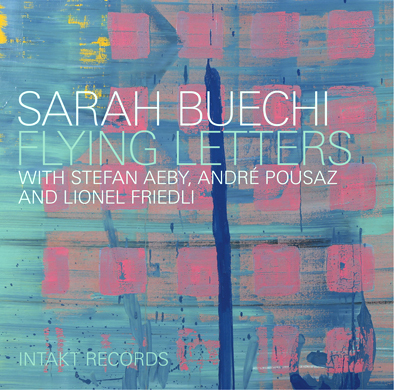 Eine virtuose Sängerin mit klarer Identität: Die Schweizer Sängerin Sarah Buechi präsentiert mit "Flying Letters" auf Intakt Records eine aussergewöhnliche Platte zwischen Jazz und Songwriting. Reisen, unterwegs sein. Auf Reisen und Studienaufenthalten in fremden Kulturen hat Sarah Buechi ihre Musik entwickelt: Ein Jahr lang war sie am berühmten Karnataka College of Percussion in der südindischen Millionenstadt Bangalore, wohin sie nach ihrem Studienabschluss an der Musikhochschule Luzern für weitere sechs Monate zurückkehrte. Dann studierte sie in Paris, zog nach Ghana, um die bei Steve Coleman gelernte rhythmische Polyphonie zu studieren. 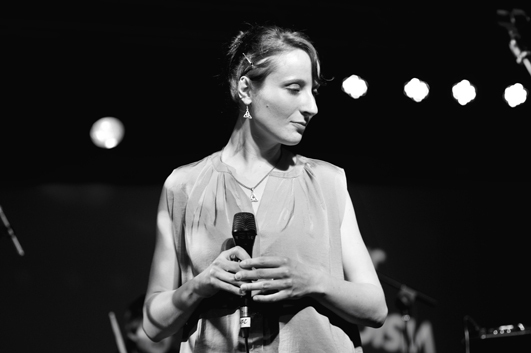 Sarah Buechi hat diese Einflüsse in die zeitgenössische Sprache von Jazz und Pop übersetzt. Auch ihre Mitmusiker, der Pianist Stefan Aeby, der Bassist André Pousaz und der Schlagzeuger Lionel Friedli, alle drei brillante Vertreter der kreativen jungen Schweizer Szene, spielen souverän mit und zwischen verschiedenen stilistischen Idiomen. Eine Musik eben, die eine eigenwillige, unverwechselbare Persönlichkeit hat. Sarah Buechi's debut on Intakt Records has a clear, unique identity. The diverse musical contents are drawn into various orbits by the gravitational pull of her strong personality, her distinctive voice, her particular approach to composition and the quality of her texts, often multilayered. Travelling, being on the move has a very existential significance for the Swiss singer Sarah Buechi. For a year she studied at the renowned Karnataka College of Percussion in Bangalore. In Paris she took lessons with Médéric Collignon. At a workshop by the New York saxophonist Steve Coleman in Dublin, where she was now working as head of vocal department at the Newpark Music Centre, she discovered a rhythmic concept based on the simultaneous use and overlaying of various different extended metres. Sarah Buechi went to Ghana, where she studied for a month with the great balafon master Bernard Woma at the Dagara Music and Arts Center in the outskirts of Accra. Sarah Buechi has distilled these influences and translated them into the language of jazz and pop. 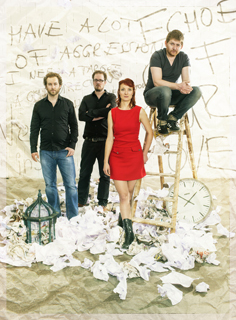 Her musicians, the pianist Stefan Aeby, bassist André Pousaz and drummer Lionel Friedli, all shining stars of the young, creative Swiss scene, play across and with these various stylistic idioms. Music indeed, which comes from somewhere or another, with a strong, unique and clear personality.